Is Diet Soda Safe While Pregnant and Breastfeeding? To drink, or not to drink diet soda: this is a commonly asked question during pregnancy and breastfeeding. Many women whose pre-pregnancy drink of choice was a calorie-free, thirst-quenching Diet Coke or Diet Pepsi may have a difficult time giving up their sweet, sugar-free beverage fix. Fortunately, pregnant and breastfeeding women don’t need to forego diet drinks altogether, but for some, it may be a good idea to cut back. Diet drinks are certainly a better option than regular soda which can contain more than 40 grams of sugar in a 12-ounce serving- more than two times the limit for a woman’s added sugar intake for the whole day (the daily limit is 6 teaspoons or 24 grams of added sugar per day). Even so, women who drink multiple servings on a daily basis should reduce that amount due to the potential health consequences that chronic diet soda consumption can have on their and their baby’s health. 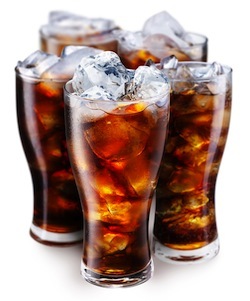 Research doesn’t show any negative effects for people who enjoy drinking a diet soda every once in a while, but for those who drink 2 or more cans every day, there have been some recent studies linking this amount of consumption to some types of chronic disease such as lymphoma, though more research needs to be done to prove these findings (1). More importantly, there doesn’t seem to be any benefit of weight loss for chronic diet-soda drinkers. In fact, as the US population’s consumption of diet soda has increased, so has obesity. Additionally, soda also contains caffeine, with 45 milligrams per serving. Three servings of caffeinated diet soda a day will provide 135 grams of caffeine- almost hitting the daily recommended limit of 150-300 milligrams during pregnancy. Combined with any other caffeinated foods such as chocolate, tea, or coffee, a pregnant woman may easily go over the limit. For women whose go-to beverage is diet soda, a good start to reduce intake is to cut back to one serving every other day. For the general population, a person would have to drink more than 6 cans of diet soda every day to go over the safe daily amount determined by the Food and Drug Administration, but a pregnant woman should be even more conservative in her consumption to protect the health of her baby. With a pregnant woman’s need for increased hydration to support fetal circulation, amniotic fluid, and a higher blood volume, water is the beverage to chose when it comes to staying hydrated. Not only does water provide zero calories just like diet soda, but it also has zero risk of any negative health outcomes. It is recommended that a pregnant woman consume 8-10 eight ounce servings of water daily, and a breastfeeding woman consume 10-12 eight ounce servings daily. If you crave the sweetness and carbonation of soda, try a low calorie spritzer by simply adding an ounce of juice such as cranberry, grape, or pomegranate to eight ounces of seltzer water. Another idea is to create infused water by adding sliced cucumbers, orange slices, or strawberries and basil to a pitcher of cold water, or add fresh ginger to cold water for refreshing, sugar-free, and all natural hydration.